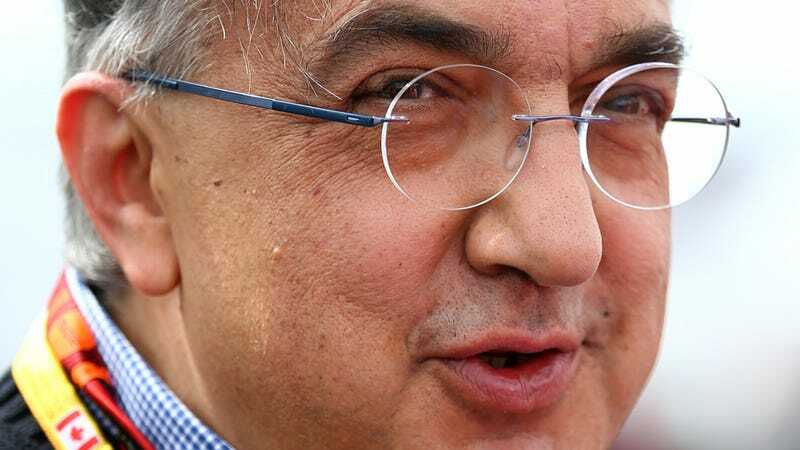 What The Hell Is Fiat Chrysler's CEO Really Up To? Fiat Chrysler CEO Sergio Marchionne doesn’t have a reputation for being a creep. He does have a reputation as a shrewd negotiator, and a man so obsessed with ruthless efficiency he buys sweaters in bulk. So what was dribbling out of his mouth about “hugs” and “forcing a partner,” namely General Motors? Probably more than meets the eye. Inarticulate, at best. Unprofessional, at worst. One has to wonder if he’d say the same about Ford CEO Mark Fields. Marchionne then went on to say that his own company could continue surviving “in mediocrity,” which is exactly the sort of pep talk you expect from a crap football coach on a crap football team before the season even starts. Guy’s got a way with words, is what I’m saying. “Look, the combined entity can make $30 billion a year in cash. Thirty. Just think about that [expletive] number,” he said. “In steady-state environments, it’ll make me $28 to $30 billion,” at a seasonally adjusted annual selling rate of 17 million. I’m not saying the numbers aren’t right. I’m just saying that every word that we’ve heard about it out of Sergio’s mouth seems to only refer to two companies, existing in a vacuum, without any sense for how those companies operate. A merger of the two companies would probably destroy Fiat Chrysler Automobiles as we know it. Just look at where those “synergies” exist. GM has a lot of vehicle platforms, and FCA has a lot of platforms, ergo, the logic goes, the two companies would merge and wouldn’t need so many platforms. But in a world where GM takes over FCA, in a world where GM gets to raid the parts bins of Fiat, Alfa Romeo, Chrysler, Dodge, and Jeep... what does GM take, and what does it leave on the scrap heap? Jeep, for fairly obvious reasons, stays no matter what. It’s just too valuable to give up. Does it take platform underpinning the Chrysler 200, the C-Evo, which also underpins the Alfa Giulietta, Dodge Dart, and, in mutated form, the Jeep Cherokee? Probably not, not when its got plenty of competition on its own. We can keep going down the list, but the long and short of it is that most of FCA’s own platforms get wiped out. Which is fine, I suppose, as I’ve got no emotional attachment to infinitely scalable vehicle architectures. But from a business standpoint, the argument falls apart. Let’s say, in the effort to achieve such synergies, all of FCA’s platforms, save for the one that underpins the 500 and the ones underneath most Jeeps, end up in the scrap heap. And from those ashes rises a new Fiat, a new Chrysler, a new Dodge. Fiat focuses on the small cars, and that’s fine. But cars like the 2021 Chrysler 300 and the 2023 Dodge Charger are share underpinnings with cars like the Chevy Malibu. But since they already compete in the same market segment as the Malibu, they’re a bit redundant. Which is okay, for some companies. Look at Volkswagen. In the interest of platform sharing, so many cars overlap so thoroughly it can be a bit hard to tell which car is what nowadays. But GM isn’t Volkswagen. In fact, GM just finished jettisoning many of its redundant brands just a few years ago. The Volkswagen Group doesn’t really have brand overlap — GM/FCA would. And therein lies the rub. If I’m GM, I’m having a hard time buying what FCA is selling. Sure, GM would probably bump up its market share in Europe, where Opel is floundering, but Europe isn’t the market of the future. Asia is. And when it comes to China, specifically, it’s GM’s market to lose. FCA is relatively minuscule in the market. It’s got nothing to offer there, not for any price that would justify the corporate headache that a massive merger always is. So when push comes to shove, Chrysler loses out. Dodge loses out. It’s possible that even the Fiat brand collapses. And don’t even mention Ram, who needs two competing large truck brands? Nobody. In the end, it would turn FCA into AMC, right when FCA’s future is looking incredibly bright. But is a truncated Jeep attached to rest of GM worth that sort of headache? The one that can leave both companies worse for the wear, as it did to both Mercedes-Benz and Chrysler more than a decade ago? Sergio’s probably a smart guy. He’s definitely got years of experience doing this whole business thing. He undoubtedly knows all of this. So why is he still going on about how FCA and GM would be a match made in heaven? GM’s already rejected his entreaties multiple times. GM’s shareholders have been given an opportunity to weigh in. And still, it’s all going nowhere. So at this point, I’m wondering if we’re all not looking at some sort of proverbial red herring. Why is Sergio being so loud about this, after all this time? If he wanted a deal to get done, wouldn’t he get it done seriously, without talk of “hugging,” and wouldn’t he get it done quietly, again, without talk of hugging? In mergers and acquisitions, big deals tend to get done quietly. They tend to get done resolutely. They tend to get done without a peep. And they never get done like this. But there are scenarios when we do see hijinks like this. Scenarios where there are other, unnamed suitors. Scenarios where someone who could benefit from a lot of synergies are waiting in the wings, and are engaged in serious talks. Scenarios where Fiat Chrysler Automobiles has a lot of what one company wants, and one company has a lot of what Fiat Chrysler Automobiles wants. I might be nuts, but if I was FCA, I’d be aiming every word that came out of my mouth straight at Geely. FCA’s got both the European and North American market share and penetration that Geely wants, long after its done experimenting with Volvo. Geely’s got all the market share and penetration in Asia that FCA wants. You can’t get more synergistic than that. Maybe Geely’s not interested. Maybe Geely doesn’t want it. But if you had to pick a very short list of car companies that would be salivating at the thought of everything Sergio’s saying, they would definitely be on it. And we haven’t heard a peep out of Geely. Sergio’s crazy, but he’s crazy like a fox.